Located right in the centre of the Gold Coast, cosmopolitan Broadbeach has something for everyone. Our Broadbeach resort apartments are located close to many of the most popular sights and attractions on the whole coastline. Broadbeach is renowned for its vibrant and varied culinary scene and boasts over 100 restaurants and cafes serving everything from international specialities to fast food favourites. Broadbeach mall is home to an enticing array of cafes and bistros and its scenic beachside location makes it a great place to dine alfresco. Shopaholics will love Pacific Fair Shopping Centre, one of the biggest indoor retail centres in Australia, while Niecon Plaza and the Oasis Centre offer a tempting selection of designer boutiques, gourmet food shops and beauty salons. Our Broadbeach apartment accommodation is just 100 metres from the beach. With its long stretch of clean white sand, large patrolled swimming area and grassy parklands along the beachfront, Broadbeach is one of the most popular family beaches on the whole of the Gold Coast. Enjoy a family game of Frisbee, swim in the temperate clear waters of the Pacific or simply sit back and soak up some sun. 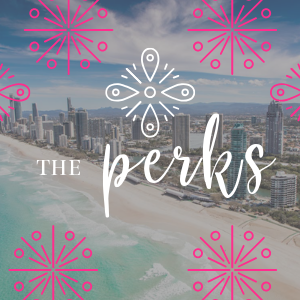 Our apartments are located close to many of the best theme parks and family attractions the Gold Coast has to offer, making it the ideal choice for your next family holiday. Wet ‘n’ Wild Water World, Sea World, Movie World and Dreamworld are all within easy reach and Surfers Paradise is just a few minutes north. Treat the kids to a visit at Currumbin Wildlife Sanctuary or catch a movie at the newly re-opened Event Cinemas at Pacific Fair Shopping Centre! Just a short walk from our apartments is the fabulous and ever entertaining Gold Coast Convention and Exhibition Centre. We are one of the closest places to stay when you catch that live show, exhibition or sporting event!